While speeding may cause the majority of in-car arguments, which are huge distractions to driving, there is little doubt that cell phone usage while driving has a huge impact on American roads. This impact starts with the 995 people that were killed in crashes involving distracted driving by way of cell phone in 2009. To all the devotees of technology: We’re sorry, but it is true – cell phones are the primary villain in a nearly one-fifth of all distracted driving fatalities. In all, 5,474 people were killed in 2009 in distracted driving-blamed crashes. These incidents also cause plenty of injuries as well. Distracted driving crashes accounted for 448,000 wounded on the battlefield we call our roadways. No matter how safe you think you may be, if you’re using a cell phone while you’re driving, you’re being distracted. In fact, the use of ANY type of hand-held device while driving – cell phone or otherwise – makes you four times more likely to be involved in a car crash or collision that is serious enough to leave you with injuries. You may be thinking at this point “But I don’t text, and I use a handsfree system when I talk on my cellular phone.” Even with a hands-free device, such as a Bluetooth headset or entertainment system, you’re still a distracted driver. Remember – anything that takes your hands off the wheel, your eyes off the road and perhaps most importantly, your mind off the task of driving your car is a distraction, period. “The safe operation of a car requires the full attention of the driver. The danger is that people can become so absorbed in their conversations or activities that their ability to concentrate on driving is severely impaired, jeopardizing their safety as well as vehicle occupants and pedestrians” said Jeanne M. Salvatore, senior vice president of public affairs at the Insurance Information Institute (III), which has conducted extensive research on cell phone use by drivers. An in-depth research study conducted by the University of Utah demonstrated just how detrimental using a cell phone could be while driving. If you’re behind the wheel while speaking on your cellular phone, using it to text or to check your email or even doing things like surfing the web, you’re as likely to cause an accident as someone with a blood alcohol level of 0.08. That’s a BAC that is considered legally intoxicated in all fifty states. So can you stay safe? Before taking or placing a call, pull off the road. We’re serious – you really shouldn’t ever use your cellular phone, even with a hands free device, while you’re driving. Use your voice mail. And no, we don’t mean check your voice mail while driving. What’s the harm in delaying a conversation? Not only are you keeping the safety of yourself and others at the forefront, but the conversation will still be there once you’re able to pull of the road. 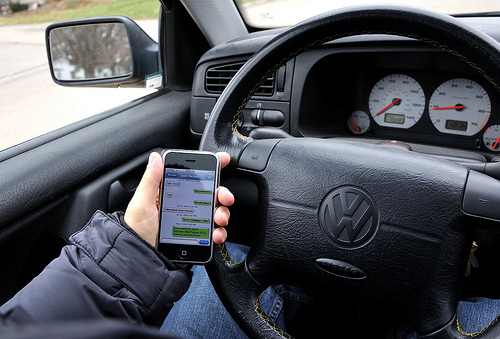 If you insist on using your cell phone while driving, remember that you need to at least keep your eyes on the road. That means utilizing voice-command or other hands-free technology to keep your eyes on the road, even as you have conversations. Get the call over and done with. Since you’re supposed to be focused on the road and the fact that you’re driving two-tons of steel and plastic, you should keep your conversations brief. Don’t discuss stressful topics while you’re driving. If you haven’t pulled over to have your phone call, there is no reason to add more stressors and distractions to your already full plate. Besides, if the topic is that stressful and that important, doesn’t it deserve your full attention, rather than dividing it between driving? Never use your mobile phone to text, email or surf the web. We don’t care who you are, doing these tasks will not only take your mind and eyes off the road, but they’ll also cause you to take your hands off the wheel. That’s the deadly trifecta of distracted driving, all rolled up into a single task.